This holiday house offers a nice sea view, exclusive equipment, a beautiful roof terrace, and self-catering. There is a 120 sq.m living room, a 40 sq.m terrace and balcony, and a 40 sq.m terrace. You will also find an underground parking, 3 bedrooms for 6 people, and 2 bathrooms. It is located in front of the sea and has a small garden. Pets are allowed. The rental fee per week varies between 400 and 700 Euro. 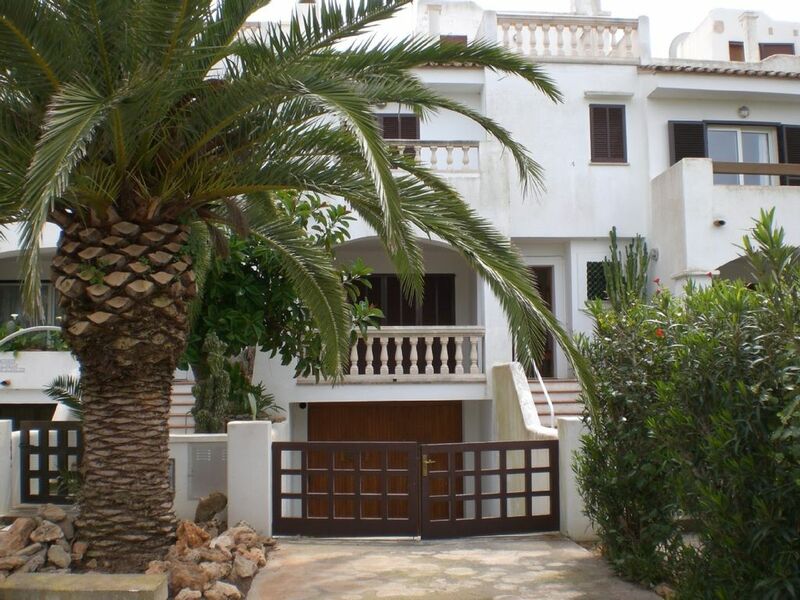 The house is located in a quiet residential area, just a few minute walk from the beautiful natural beach of Es Trenc. In the entrance area, some beautiful Mediterranean plants grow, and there is a small staircase leading to the ground floor. There you will find the living area with a fireplace and access to the outdoor terrace. There is also a well-equipped kitchen with dining area and access to another terrace and a small garden. In the garden, blooming from spring to fall, there are other beautiful Mediterranean plants and access to the BBQ. On the 2nd floor of the house, there are 3 bedrooms, 2 of which have access to a balcony as well as 2 bathrooms. On the first floor, there is a roof terrace. The two bathrooms on the 2nd floor are bright and well equipped. Towels and hair dryer are available. In the basement, there is a guest toilet. The kitchen is completely equipped. The stove is equipped with a ceramic hob, important kitchen utensils, a coffee machine, a kettle, a toaster, a juicer, baking utensils, deep fryer, pots of all sizes, crockery for 12 persons, pans, tablecloths and place mats. Wir haben einen sehr schönen Urlaub im Februar in der Casa Maya verbracht, dank eines Riesen Hochs über Europa war es tagsüber sonnig und warm wie im Frühling, nachts noch sehr kalt. Das Haus ist prima ausgestattet und bietet mit den Terassen immer irgendwo Sonne. Gerne kommen wir wieder..
Sauber, sehr freundliche und sich kümmernde Vermieter, alles perfekt! Wir haben die Woche in dieser Ferienwohnung sehr genossen. Die Lage war für uns zum Best Center perfekt und auch an die Strände und in den Stadtkern kommt man schnell. Alles war sauber und die Vermieter sind super freundlich und kümmern sich um alles. Für die Nacht ist es auch eine ruhige Lage. Wir hoffen selbst, wir haben bei unserer Abreise alles gut hinterlassen. Wir kommen gerne wieder! Die Dach,-Sonnenterrasse ist herrlich, mit tollem Blick über Colonia St. Jordi. Alle Zimmer und Badezimmer sind geschmackvoll und liebevoll eingerichtig. Wir haben uns hier richtig wohl gefühlt und kommen sehr gern wieder. Die Vermieter sind sehr hilfsbereit, in deren Restaurant ist es voll lecker und gemütlich, das sollte keine Schleichwerbung sein. Wir haben einige andere Restaurants, im Ort oder am Hafen ausprobiert, und wurden nicht enttäuscht. Wir werden die Casa gern an Freunde und Bekannte weiterempfehlen. Die Vermieter sind sehr hilfsbereit, in deren Restaurant ist es voll lecker und gemütlich, das sollte keine Schleichwerbung sein. Wir haben einige andere Restaurants, im Ort oder am Hafen ausprobiert, und wurden auch hier nicht enttäuscht. Wir haben uns sehr wohl gefühlt. Alles war sauer und gepflegt. Die Vermieter waren sehr nett. Wir würden es weiter empfehlen an Freunde und Familie. Wir wollten 2014 gerne wiederkommen aber leider ist es für den Zeitraum schon besetzt. Vielleicht ein Jahr später. Colonia de Sant Jordi is located on a small peninsula in the south of Mallorca. This former fishing village is now a beautiful holiday village with a pretty harbour. Along the harbour, there are many cafés, restaurants and bars to visit. Even a short stroll along the shops is also worth it. Colonia de Sant Jordi is framed by two longest and most beautiful beaches of the Mediterranean Sea: Es Trenc and S `Ava II, with shallow shores and crystal clear water. In this place, you can enjoy all kinds of water sports or just a walk on the white sandy beach, enjoying the view. On the newly created Paseo (path), you can explore the entire region on foot, discovering small sandy and rocky beaches. We recommend a trip to the island of Cabrera with an excursion boat directly from the harbour of Colonia. In the village, there is a Maritime Museum which was opened in summer 2008. Sport facilities on site: water sports, horse riding and fitness room.